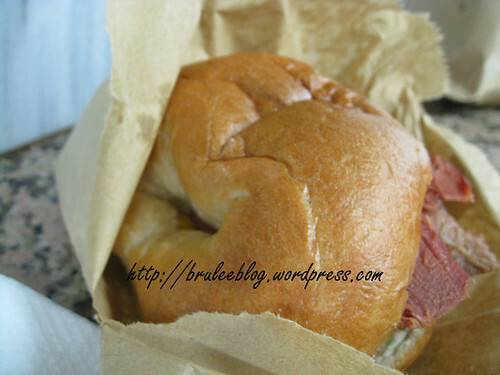 Yes I said beigel, not bagel. 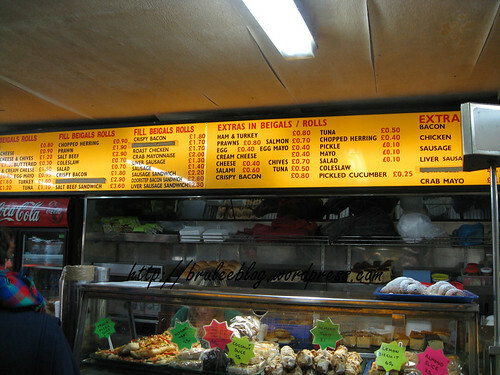 If you’ve ever been to London’s Brick Lane, you’ll know exactly what I’m talking about. 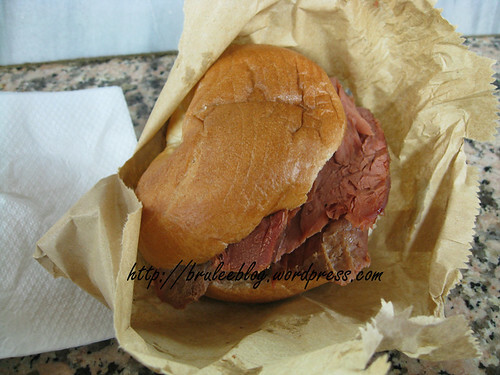 At one end of the street (far from the many Indian restaurants and sweet shops that frequent the Whitechapel High Street end of Brick Lane), sits two little competing establishments that specialize in hot salted beef served on a fresh beigel. Each has their loyal fans, and their differences basically add up to a Coke vs Pepsi type of argument. 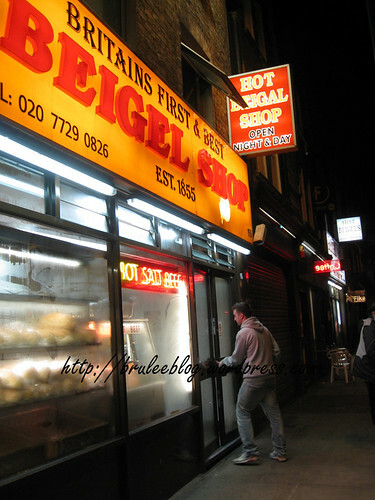 One, called the Beigel Shop, has a bright yellow sign and the other, the Beigel Bake, has a bright white sign. Both are open 24 hours, and are a favourite for fulfilling late night/drunk hunger pangs. We stood there on the dark street, and looked at each other in puzzlement. Which one to pick? Both had plenty of people going in and out of them. In the end we went for the Beigel Shop’s yellow signs, as at the time the service seemed to be moving at a faster pace than the other one. Just look at those prices! I think this was probably the cheapest meal I had while in London. 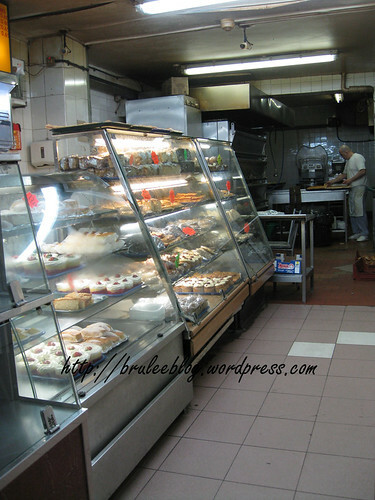 There are also a wide array of desserts. Nothing too fancy – mostly bars, cookies, cake, etc. And here is the finished product. It was a good-sized sandwich… about the size of a hamburger. The buns all have the traditional bagel hole, but that’s where the similarities end. These beigels are soft. So soft that they’re actually fluffy and more closely resemble a hamburger bun than the harder, denser bagels that we’re used to in Canada and the US. Once your teeth sink past the soft bread, they hit the hot salted beef. It’s tender like true Montreal Smoked Meat but not as spicy. 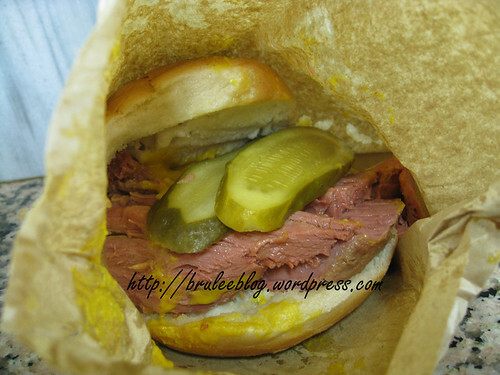 Mixed with the sharpness of the mustard and pickle, each bite of the beigel is sure to satisfy any craving for meat or salt. I debated ordering another one or going to the other beigel place to try their version, but eating one was plenty of food for me that night. YUMMY. How is it that something this simple can have such appeal? 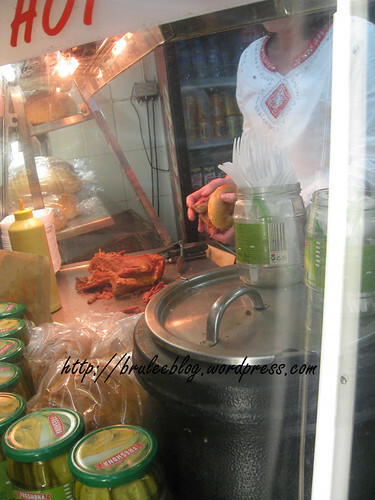 I rarely eat street food but I am completely enamoured by it!!!! Heavenly Housewife has posted about the other one, I think. Worth the read. I can’t beleive I was in Brick Lane and didn’t chow down on theseeee kicking myself !!! 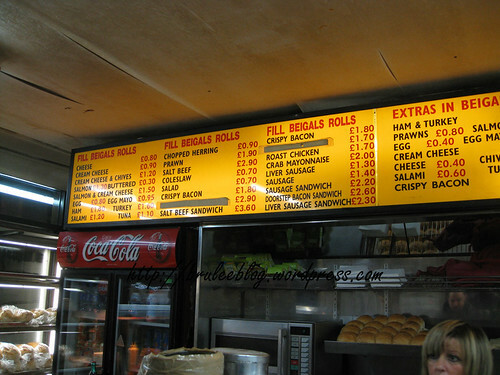 though I did eat Zengi felafel £3 !! 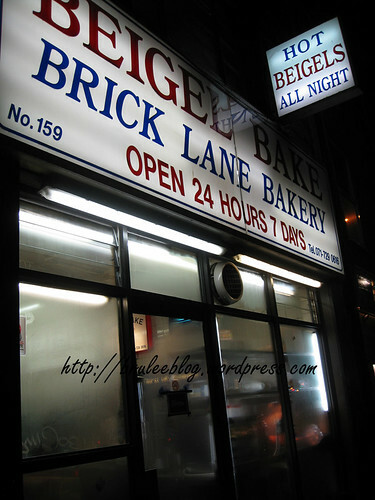 just found this write-up while reminiscing with a friend about brick lane beigels.. bummer you didnt go to the other one, cause its heaps better!